Registry Commander is designed to replace Windows RegEdit. It supports all 12 data types in the registry, defined in the "winnt.h" header file. The advanced search feature allows you to search part or all of the registry by keyword, size or data type. You can bookmark keys or values so that they can be accessed more quickly. You can also change the data type of a value without affecting its content. How to extract: Download the RAR package and extract to a folder of your choice. Launch RegCmd.exe. Fixed an issue with sorted bookmarks. Any action done when a list was sorted, would not act on the correct item. I haven't tried this much for editing yet but in a quick search test, Nirsoft's RegScanner http://www.portablefreeware.com/index.php?id=931 was the best in speed and number of results for me. I seem to need search capabilities more often than basic editing. @dany: Thanks; the script works fine on startup. Too bad it can't be used during the session. 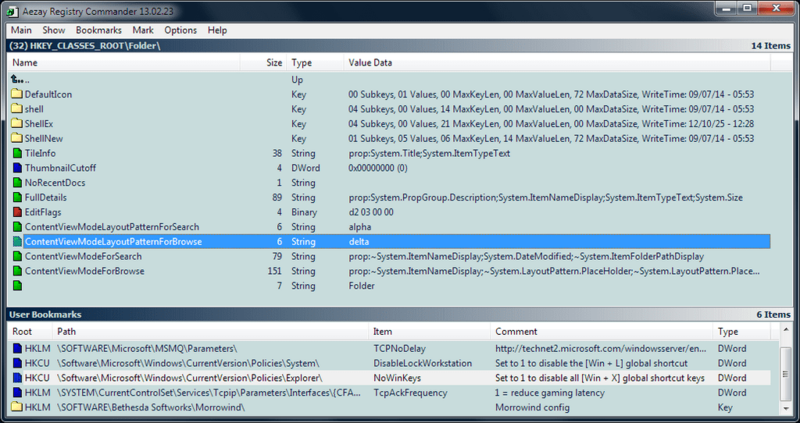 I like the way the registry is being displayed in Registry Commander. Very clean. Also, Registry Commander's font choice option makes it a whole lot easier to read all that stuff! Bill: true. More information would certainly be better. webfork: Agreed, it often it is the case, and I'd like to give this developer the benefit of the doubt. To clarify, it's not the design, but the extreme lack of information on the page, that creates dissonance for me. Because it is, after all a registry editor, I'd like more reassurance. Cursory info on license, platforms, basic features, etc would be easy enough to add. Bill: good software developers frequently aren't very good web developers. The quality of the website doesn't necessarily reflect on the software. I have been watching this app for quite a time now, and the website makes me feel uncomfortable about the app because there has only ever been a title and a screenshot, and a download link. The author's site is back online, with the current download link, which appears to be version 10.04.24 ..
update to spport vista and windows 7. I anticipating a portable version of this program. No installation required! Sadly it does not support Windows Vista. So I cannot put my trust in this program when I have to change some registry entries/settings. Press Ctril+T no right click when I want to execute the entry. I have to double click it. I cannot also delete the entry. I cannot contact the author of this program that's why I'm posting my suggestion here in forum. thanks alot for the alternative link! The website seems to be down, so I figured I should post an alternative link to this program.